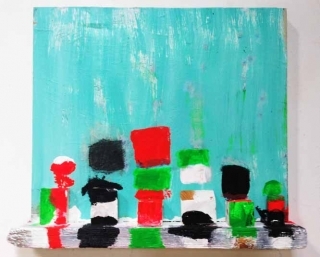 Aqua Blocks, 2014, Acrylic paint on wood, cardboard and two by four, 18 1/2 x 22 x 4 1/2 in. Pheonix, 2014, Acrylic, wood, paper mache, clay, cardboard, 18 1/2 x 24 x 5 in. Opening reception: Saturday, November 15th, 7-10 pm. 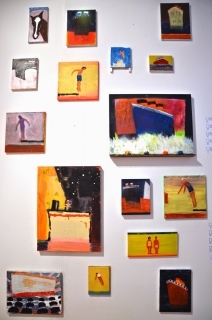 Katherine Bradford has been developing and enriching the art of hybrid painting/wall sculpture, which she calls Shelf Paintings, for her latest project now on view at Arts+Leisure in East Harlem. 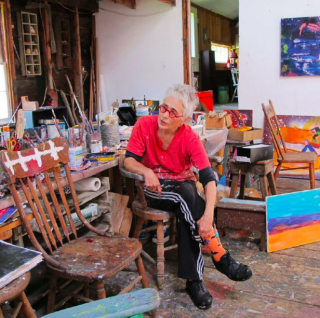 Her past exhibitions have included images of ocean liners, swimmers, divers, supermen, and assorted whimsical objects and figures; but as is always the case with her work, the real subject is invariably paint itself, in all its multi-hued, crusty, clunky, gooey, crumbly, smeared and expressed glory. 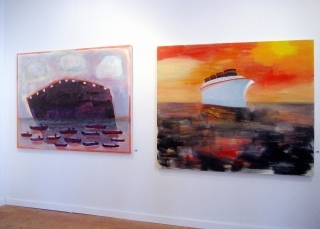 Her shelf paintings reference the horizons and brute forms of Philip Guston as much as the armature and palette of Howard Hodgkin, and the distortion and nautical humor of Malcolm Morley; her palette blows hot and cool but her signature playful line and irreverent charm shine through consistently in every piece she makes. But don’t let their simplicity and humble format mislead you – Bradford’s constructions are neither facile nor easily attained. They are a result of years of a dedicated, watchful, soul-searching studio practice, of years of steady addition and erasure, of multiple subtraction and accretion of paint and wood and clay and found material until the object becomes Something Else - undefined but clearly Bradford’s own. There is a kind of magic in these shelf works, a process of constant rebirth and seeing afresh so that every venture is made new and surprising. The titles – such as Liner Shelf, Phoenix, and White Preserver are testament to Bradford’s painterly themes – footnotes to her studio practice itself. She seems to say, why just store artwork on a shelf when you can show the whole shelf itself? …for a long time I felt there was a lot of weight and gravity at the bottom of my paintings…things would accumulate there…’lumps’ with a lot of character. The ‘ledge’ idea became very infectious….much of it was about an unconscious act rather than a conscious decision. ‘Bach’ for example is not so much a reference to the composer but really a collection of letters and paint. The most important thing… is to push your work forward. Pushing the work forward is exactly what the shelf, as an artistic device, does: it projects the painting into three-dimensional space until it morphs into something different - it becomes a wall sculpture. And this adaptive quality is precisely what makes Bradford’s work to my mind so exciting, so evolved, so rich in depth and feeling. It is a pleasure to present this group of new Shelf Paintings at Arts+Leisure this November. I hope you revel in them and learn from them as much as I do. Bradford received a bachelor’s degree in Art History from Bryn Mawr in 1964. After a long hiatus given over to raising her twins, painting as much as she could, and writing reviews of art shows for The Maine Times, she relocated to New York City and began graduate studies at SUNY Purchase. Bradford is represented by Edward Thorp Gallery. She has exhibited her work at PS 1/MOMA, the Brooklyn Museum Canada, Zeiher Smith, Freight & Volume, Pierogi and Stephen Harvey Fine Arts in New York; as well as Vox Populi and the University of the Arts in Philadelphia, Samson Projects in Boston, George Lawson Gallery in San Francisco, Zola Leiberman in Chicago, Adams and Ollman in Portland, Oregon and the Addison Gallery of American Art in Andover, Mass. She is also represented in the collections of the Metropolitan Museum of Art, the Brooklyn Museum, the Addison Gallery of Contemporary Art, the Wooster Museum and the Museum of Art at Bowdoin College and at Smith College. She continues to be a fixture in the art communities and a generous supporter of other artists, especially as a teacher. Please join us for an artist’s reception with light refreshments on Saturday, November 15thfrom 7-10pm. The exhibition is accompanied by a full-color, 50-page limited edition book,Shelf Paintings, designed by Ninze Chen, available for sale signed or unsigned.